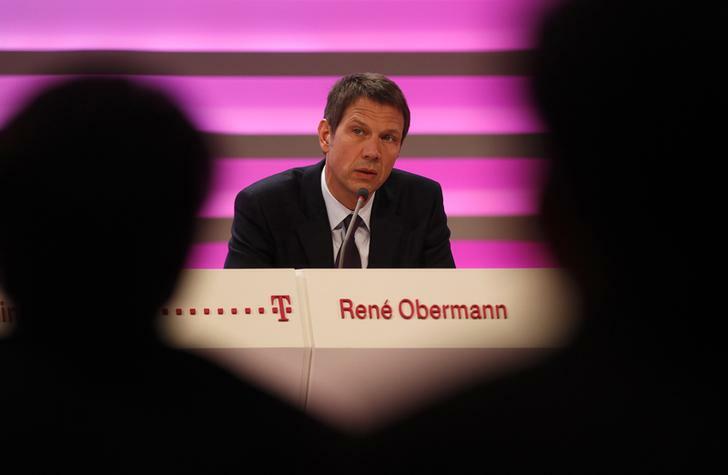 Rene Obermann is leaving Germany’s biggest telephone company in decent shape. Still, his successor as CEO faces big decisions on DT’s U.S. and UK units – and how to react if AT&T gatecrashes the European market. Timotheus Hoettges’ dealmaking skills may be quickly tested. Deutsche Telekom, Europe’s third-largest telecoms group by market value, said on Nov. 7 that wireless revenue fell in the third quarter, even though it added 470,000 new mobile customers. Shares in Deutsche Telekom stood 2.1 percent lower by 1547 GMT at 11.36 euros a share. Overall, Deutsche Telekom’s third-quarter earnings beat expectations, helped by the improving performance of its T-Mobile U.S. unit, which had already reported separately. EBITDA before one-off items fell 2.6 percent to 4.7 billion euros ($6.3 billion). Analysts polled by Reuters had on average forecast EBITDA of 4.6 billion euros. These are the last results under Chief Executive Rene Obermann, who is leaving at the end of the year to become CEO of Ziggo, the Dutch cable company. He will be replaced by Timotheus Hoettges, currently chief financial officer.